Make Dad feel extra special this year with a gift that’s made just for him. With a little thought and a splash of creativity, you’re on your way to making this Father’s Day one he’ll never forget. And we’re here to help. Our collection of DIY Father’s Day gifts are filled with love, style and easy tutorials. From delicious brownies to fashionable ties and personalized flasks, there’s something here for every dad. No matter your crafting abilities, you’ll find an idea to bring to reality. For all Dad does, create something unique for him this Father’s Day. Search our gallery for just the right gift and check out personalized gifts that can be made in minutes and still have that handcrafted feel. Spice up Dad’s special day with hot pepper infused olive oil. Take tips from A Beautiful Mess and choose a bottle that offers easy pouring. It’s almost guaranteed he’ll be drenching his meats, eggs and veggies with this gift. This stylish skinny tie offers Dad a new look with a story to tell. When his co-workers or partners ask him where he bought it, he’ll say it was made by you. Check out the supply list and instructions at A Beautiful Mess. Fill Dad’s heart with love every time he fills his mug with coffee or tea. 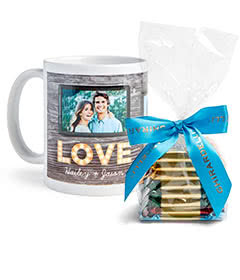 Customize a mug today with a collection of favorite memories, like fishing together or exploring a nearby town. For a dad that loves to browse the web, this DIY laptop desk is the perfect gift. Choose a fabric that matches Dad’s style and is appropriate for professional occasions. No sewing required with this project from A Beautiful Mess. When the wind blows and the sun shines, let this mobile catch the magic. Using scrap materials and tips from Adventures in Making, your gift will burst with all the colors of the rainbow. Dad can hang this outside the kitchen window or on the back patio. Looking for a gift that will last forever? Design mounted wall art with photos from a family vacation or favorite memory. He’ll be proud to display these in his office or at home—and they’ll remind him of all the fun times you’ve shared together. With this caramel crunch brownie recipe from Bakerella, you’ll have Dad raving on the first bite. To make the gift extra special, wrap them in a pastry box and tie with a ribbon. When Dad’s outside on the deck or patio, he should have the perfect spot to kick back and relax. These custom outdoor pillows are comfy, weather resistant and easily personalized with photos from this year’s favorite moments. Freshen up Dad’s spice cabinet this year by trying Barefeet in the Kitchen homemade taco seasoning recipe. He’ll love adding this flair to tacos, fajitas, quesadillas and more. Have a Dad who loves games? Bring a twist to his collection with DIY Pete giant tower game. Paint the wood pieces or leave them natural. There’s no doubt Dad will be ready to host summer parties! During a long day at the office, Dad can look down and be reminded of his favorite moments with you. With a personalized mouse pad, the special photo you add will bring joy to his day and a sense of lightness to all the work he does. Go all natural this Father’s Day with homemade shaving cream. Using the rosemary mint mix from Food For My Family, you can supply Dad with a whole year’s worth of cream. He’ll be clean shaven, smelling fresh and feeling good. If you’re searching for a keepsake gift Dad will have forever, look no further. This uniquely engraved glass photo frame offers you a chance to share one of your most special memories with Dad. Choose a photo from an unforgettable day, like a birthday, anniversary or summer holiday together. Just in time for summer fun! This colorful kite by Handmade Charlotte is constructed with paper, string and bamboo sticks—and it’s simple enough for the kids or grandkids to make. Dad will enjoy letting it soar at the beach or in the backyard. With his favorite beer or cider in hand, Dad can unwind in style. Customize a pilsner glass with your choice of lettering, and he’ll think of you every time he uses it. When Dad’s relaxing at the river or lake this summer, he’ll think of you every time he casts his line. Design a fishing rod from a wine cork using Imagine Childhood’s nifty guide. Throw a dash of love into Dad’s garden. With a custom garden stone, his outdoor world will become a bit brighter. Every time he weeds the flowers or plants the vegetables, he’ll be reminded of you and your thoughtfulness. Father’s Day crafts bring out our creativity, love and special skills. For the nature-loving dad, construct planter boxes using tips from Jenna Sue Design Co Don’t forget to fill the boxes with herbs, flowers or vegetables. Whether Dad has an iPhone or Android, you can create a smartphone case that fits his personality. Add fun photos he’ll enjoy seeing everyday—like those from an afternoon at the ballpark. Crunchy and savory, this Jennifer’s Kitchen pickle recipe is bound to make Dad ask for more. Marinating the cucumbers in garlic, lemon juice and dill seed offers a fantastically fresh taste for Dad to enjoy all summer long. The best Father’s Day gifts come from the heart. This DIY shirt shows you care about Dad by putting extra time into his special day. Choose his favorite color and get to work with Jessica Watson’s t-shirt guide. With his favorite drink tucked in this personalized flask, Dad can head out to hunt, ski or go for a hike. Design one today that can be shipped right to your door. When those tough days happen, it’s always reassuring to know we are surrounded by love and appreciation. Design a photo cube that will remind Dad of your special times together, like relaxing at the lake or sharing a Thanksgiving meal. Want to prepare something different than the typical breakfast in bed? Jazz up Dad’s morning with one-of-a-kind pancakes. Use ideas from Kitchen Fun with My 3 Sons to design pancakes in the shapes of tools, ties or sports equipment. Who’s ready for some summer BBQ? Deck Dad out with a custom apron. He’ll love how he looks in this Lia Griffith design. We all know dads deserve to relax. With a luxurious scented candle made with essential oils, Dad can unwind at the end of the day. Personalize your design with your choice of colors, patterns and photos. Splash some character onto Dad’s bookshelf this Father’s Day. With the superhero design from Little Red Window, you’ll impress Dad with your DIY skills and make his office or library a lot more fun. Even the simplest moments, like a late evening talk with Dad or a bike ride through the park, are the most precious in life. Capture these moments for Dad with a customized wood frame for Father’s Day. This Lovely Crafty Home string art project will bring color and style to your Dad’s office or home. Craft a piece that represents your Dad, using shapes of a favorite locale or pastime. Personalize a Father’s Day card with colorful photos representing a day where you simply spent time together. Whether it was grabbing lunch or going for a walk, memories like that last a lifetime—and mean the world to dads. Breathe extra fun into Dad’s dinner parties with festive stoppers for his liquor and wine bottles. With A Beautiful Mess’ wood burning techniques, these can be complete in a matter of hours. Brighten Dad’s day from the minute he eyes your gift. Fill these artsy gift bags from Paper Crave with healthy treats like nuts, dried fruit and trail mix. Design a metal art piece for Dad with a photo that represents a special moment—like a family reunion or trip to the mountains. He can hang this at home or in his office, and it will always tell a precious story. Share the gift of nature with Dad this Father’s Day. Handcraft a birdhouse with tips from Pink When—and watch the birds flutter to and from in your backyard. Does Dad love coffee in the morning or a cold lemonade on a hot summer day? This monogram mason jar holds both warm and cold beverages, and is customizable with the lettering and design. Create one for Dad for a unique Father’s Day gift that’s delivered right to your door. Every season is a bit brighter with colorful birds close by. Create bird feeders in fun shapes using Pretty Prudent’s guide. Dad will love the amount of life these bring to his yard! In the den, living room, office and kitchen, Dad can always use an extra coaster. Why not gift him some with extra meaning? Customize coasters for Dad today, using photos from his favorite vacation spots and local family hangouts. After a long day’s work, Dad can lounge in a chair that beams with personality. When rehabbing an old aluminum chair with Smile and Wave’s easy to follow guide, use a range of colors or stick with a simpler theme. Check out this gorgeous wooden tie rack made by Rachel Rossi. Following her guide, you can build one for Dad’s closet or coat room. He’ll think of you every time he uses it—and he’ll be thankful his morning are a bit more organized. Is there a favorite place Dad always talks about? Find a photo from our Art Library and enlarge it for his wall with a acrylic print. He’ll never forget this year’s Father’s Day gift. It’s time to get crafty! Impress Dad with a handmade wooden headboard—perfect for a master or guest bedroom. Use Rachel Rossi’s tips to get started. That’s right. You can make a gift from concrete and used plastic containers. Check out Rad Megan’s guide for all the details on how to make these professional looking planters. Be sure to pop in succulents or herbs before gifting to Dad this Father’s Day. Perfect for his keys, watch and jewelry, Dad can stay organized with a custom catch all tray. 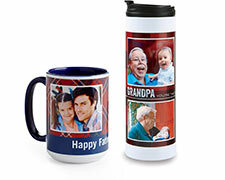 Create a keepsake with a photo of you and Dad relaxing together or enjoying the great outdoors. Who says dads shouldn’t be pampered? Stir up a batch of all natural soap embedded with essential oils. He’ll love unwinding at the end of the day with this Father’s Day idea from Savvy Homemade. From family reunions to Saturday mornings over coffee, every moment is special with Dad. Create a memorable collection of photos with a custom photo book. No doubt he’ll keep this Father’s Day gift forever. Looking for a unique gift that’s easy to make? Design a photo poster with an enlarged family portrait or snapshot. 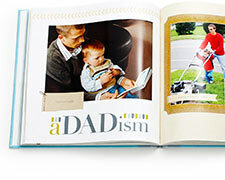 With a range of colors and layouts available, you’ll be able to create something special for Dad this Father’s Day. Dad’ll look forward to Saturday mornings with this Bloody Mary kit—complete with the tomato juice and special spices. Follow Something Turquoise’s lead and fill a mason jar with all of the necessities. When Dad has something important to place in his office or hang on the kitchen fridge, give him a festive way to do it. Customize photo magnets using memories from a recent hike in the woods or day on the family farm. At first, we thought this TV remote control was real too. With the design from Somewhat Simple, you can create a cookie that just looks like the remote control in Dad’s living room. He’ll love the idea of having the control—and a sweet treat. Pour some fun into Dad’s everyday routine with a custom photo cup. Have any photos of the two of you being goofy together? These will brighten Dad’s morning, even if it’s a fully packed day. Pack protein into this year’s Father’s Day gift with homemade beef jerky. Dad can munch on this while he’s on the trail, out fishing or relaxing at the end of the day. Choose roast or flank steak as your meat and follow The Cozy Cook’s step-by-step guide. Head to the local beer or cider brewery and pour in Dad’s favorite. He can take this custom growler to hang with his buddies or share with the family around a campfire. Craft in style with this DIY Father’s Day gift from The Merry Thought. Complete with the lampshade and tripod stand, Dad will have a whole new way of reading at night or waking up with coffee in the morning. On those cold nights and chilly mornings, Dad will love snuggling up with a blanket designed by you. Customize a photo blanket with family portraits or snapshots from a recent day trip together. He’ll love that this gift is meaningful and practical. Fill pages of a coupon book with gifts like a homemade dinner or round of bowling at the local alley. Dad will appreciate all of the thoughtful ideas—made specific to him. To create this style of book, check out We R Memory Keepers’ blog post.